Many people have started following a gluten-free diet. What does that mean? They don't eat gluten which is a protein found in wheat, barley, rye, kamut, and spelt. Gluten is also a food additive and can be hidden under the names "maltodextrine" and "dextrine". These people may be allergic to it, or just feel better not eating it, or have celiac disease. If you have celiac disease, a small amount of gluten can cause your immune system to damage your small intestine. But, celiac disease is pretty rare. For example in 2003, just 40,000 Americans were diagnosed with celiac disease (but that number is growing). Why are so many people choosing gluten-free? Well, I think that people feel better when they don't eat the many processed foods that use gluten. Hey, what about your snacks? 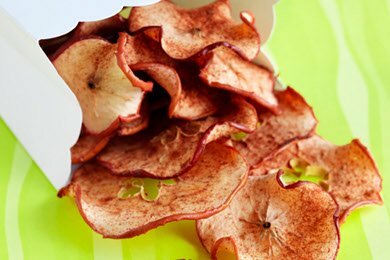 Since my goal is to feature fruits, vegetables, and low calorie snacks, I have stayed away from gluten without even realizing it (like those apple chips - photo above). Wheat flour is calorific and many of the packaged snack choices that include gluten are not healthy - for example - The Worst Snack of 2010. Perhaps, gluten-free girl and Snack Girl could become friends. Since we are girly, we could braid each others hair, get manicures, and broker a peace accord between the Palestinians and the Israelis. Actually, I just missed meeting Shauna gluten-free girl at a foodie gig that I attend. She has celiac's disease and she has written a cookbook that the New York Times named as one of the best cookbooks of 2010 (see below). You go girl! I haven't read, "Gluten-Free Girl and The Chef", but if it is anything like her blog, it rocks. On a more personal note, a good friend just started a gluten-free diet and is feeling much better. I held a small dinner party and two people attending were gluten-free (we had roast chicken, potatoes, and brussels sprouts). I feel surrounded! Holiday Weight Gain: Fact or Fiction? WOW! Thanks for putting together such a great list, much appreciated! *Celiac Disease is actually pretty common (1 in 133 people and growing) but 97% of them don't know it. That's the sad part. But education and awareness is key! *Some of the recipes are oatmeal related, and I'm a huge fan, but many of us with celiac or on the gf diet cannot tolerate mainstream oats. Although oats do not technically contain gluten, they are often grown and produced with wheat, causing most of us to avoid them. BUT there are plenty of certified gluten free oats out there, just have to keep your eye out. Thanks again for posting this and if your newly diagnosed friend has any questions, please don't hesitate to send her/him my way! Either the the website www.celiccity.com or my Celiac in the City FB page. @Sarah - Guess I should have interviewed you before I wrote this :) I will go through and remove the oats posts from the list when I get a chance. Thanks for reading and posting your resource. No worries! And you don't have to take them down (I LOVE oatmeal and eat it almost everyday) just maybe add a little note in the post that if you check out the oatmeal snacks/recipes, be sure they are gluten free. And of course, people who are familiar will already know that as a given, but it's good to let newbies know. And I truly appreciate you doing this. I've been blessed to meet so many great bloggers during this adventure. Hope to meet in person someday! Hey did you notice that my twitter nick name is gluten free? Hah. This was not intentional, I just happen to enjoy grits as a simple meal. My dad has celiac disease and I have a 25% chance of inheriting the gene. He though it should be noted did not show signs of the disease until he was in his later years about ten years ago he was diagnosed. My mom tells me it is because we are half Irish and its very common among people of Irish descent as well as Eastern Europeans. She shops at glutenfreemall.com and it seems a lot of italians are gluten free because its really common there too to be gluten intolerant. Our good friend Jason has celiac too so we are very used to slightly modifying our dinner selection to meat, veggie and no bread. It's not a huge change but it does take attention and thankfully my dad has no problem eating oatmeal, mostly because he doesnt like it and that makes for a non-issue. Another note to the newly diagnosed: If you're going to have the yogurt, walnut, and maple syrup breakfast, make sure the yogurt doesn't have modified food starch and the maple syrup is pure, without caramel coloring. Both can be made from gluten. Thanks Snack Girl! I've been a reader now for a while and I have had celiac disease since 1995! Things have come a long way since then. Unfortunately, there is a lot of misinformation out there still. Yes, Stephanie is right, maltodextrin is gluten free. As well, caramel coloring is fine too. Wheat must be labeled by law. Thanks for thinking of us, Snack Girl!! Snack Girl - thanks for the shout-out to us gluten-free-ers! I've lived gluten-free for a year and a half, and now feel like I have it down pretty well. What do I snack on? Well, I just bought a dehydrator (yippee!) so I make my own GF granola, GF beef jerky, GF apple, sweet potato, zucchini, etc chips. And more if I come up with more ideas. I also eat lots of other non-processed, naturally gluten-free foods. Carrots. Apples. Bananas. LOTS of nuts - I have raw almonds, cashews, pecans, sunflower seeds, and pumpkin seeds around all the time. (warning to those new to GF diets - read labels on nuts! some, like honey roasted peanuts, have wheat starch.) I also eat dairy-free, so on great occasion I eat coconut yogurt (So Delicious is, well, SO delicious!). And dried fruits are great too - I love raisins, dates, prunes. And for quick on-the-go processed snacks, Lara bars are heaven. in your article you say celiac disease is rare. The numbers are 1:133 people have celiac disease. That statistic has been known for years. Lots of great suggestion here, thanks very much. I always try to make my own snacks, but it's not always possible. Most of the time I'm out the door with very little notice and nothing in the cupboard! :/ I love Wailana fruit and nut bars (esp. tropical macadamia) they're just really simple ingredients like something I would have made myself in the food processor (dates, nuts,etc.) and I just grab them while I'm at Target. Hi Lisa, we have what we think, is the perfect "Seriously Healthy Snack Food", and they are called Tiger Nuts. Without a big diatribe, they are Gluten Free, Organic, High in Fiber, Low in Fat, High in Nutrition and deliver a wallop of energy with great taste. They are perfect for people with nut allergies, because Tiger Nuts are nit a nut, but a tuber, and because the sugars are all natural, they are perfect for people with diabetes.